"In this, the last concert of the year for the … Wellington Orchestra, a large audience was in attendance to appreciate both the quality on offer, and the imagination and commitment that Marc Taddei has brought to music- making in the capital. "...the real reason for drawing such a large audience was to introduce them to the powerful, deeply affecting, Fourth Symphony of Franz Schmidt. It is amazing that this was the first New Zealand performance of this taut, rich work and Marc Taddei, conducting from memory, gave a performance of extraordinary tension." "Taddei demonstrated a commitment to and a flair with Haydn that produced a gripping performance. "[conducting Schmidt’s 4th Symphony] ...the music stand and score were absent, and Taddei conducted the entire 50 minutes of the performance from memory, flawlessly, exhibiting every sign of a deep faith in this, one of the very last of the late Romantic symphonies. 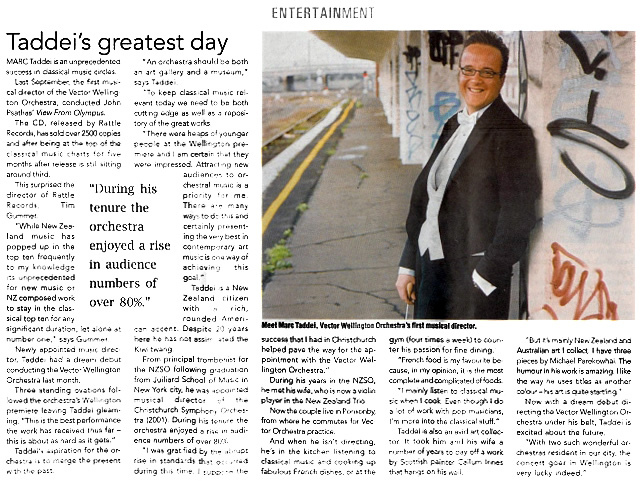 "So this last concert for 2012 was something of a triumph… the great audience [was] a heart-warming endorsement from the people of Wellington." "...a tremendous occasion in which Beethoven's vision was brought forth with blazing intensity. "It was, quite simply, Marc Taddei's show. He directed with an absolute vision of just what this pantheistic view of the world, couched in the words of the Ordinary Mass, can actually mean. And in his hands we heard something closer in vision to Janacek's Glagolictic Mass than any more obviously religious work; even operatic in the manner of the Verdi Requiem. In Taddei's hands the view that the Missa Solemnis is really a choral symphony also made sense." “[Boris Pigovat's Holocaust Requiem with viola soloist Donald Maurice] is a most extraordinary release. I guarantee it contains music like you’ve never heard before and that will leave you emotionally shattered and physically drained. …the performance and the recording are stunning, impactful, and overwhelming. “Gold stars to all involved in this production…"
“[The concert will be] best remembered for the rip-snorting performance of Berlioz' Symphonie Fantastique. ... In the excitement of the last two movements [Taddei] took no prisoners with wonderfully precise, snarling brass, bass drums walloping away and a breathtaking sense of the almost visually illustrative visual nature of this visionary piece was breathtaking. "Taddei drew fine playing for his stylish and arresting performance of the Beethoven [Fifth Symphony]." "The performance [of John Adam's On the Transmigration of Souls] was deeply moving and beautifully organised." "Under Marc Taddei’s direction the orchestral sounds blazed forth, all departments covering themselves with glory. "...the only way to tackle such a work [Beethoven's Fifth] is to do exactly what Marc Taddei and the orchestra did - which was to play the music almost as though they’d never heard anybody else’s performance, and instead make it their own." ONCE again the importance of the Vector Wellington Orchestra under Marc Taddei was underlined in a concert of balance and imagination. Considering the atrocious weather, there was an amazingly large audience on Saturday, and their enthusiasm was matched by performances of stature and vitality. In starting the concert with Schubert's "Unfinished" Symphony and ending with Luciano Berio's mix of sketches from the proposed Tenth Symphony with his own musings, Taddei gave us a programming masterstroke. In between we had the great C minor piano concerto Mozart composed in 1786 and the superb concert aria Ch'io mi scordi di te composed in the same year. All together there was a satisfying unity that showed up the comparative lack of imagination in much of the NZSO's programming. The performances were of a uniformly high quality. Diedre Irons might have lacked sparkle in the Mozart A major Concerto (K488) at the last concert but the dramatic C minor Concerto (K491), with its pre-echoes of Beethoven, suited her much better, and she gave a powerful performance well supported by Taddei and the orchestra. She was excellent, too, in the obbligato piano part to the Mozart concert aria in which Margaret Medlyn sang with dramatic power and great vocal security. This was Mozart singing of the highest class. Luciano Berio's Rendering is not a completion of Schubert's Tenth Symphony like those of Brian Newbould or, even better, Michael Vinten, but an orchestration of the piano sketches interspersed with Berio's own thoughts in his 20th century language. The effect is not unlike that of Valentin Silvestrov's modernistic language broken by echoes of ersatz Mozart (Requiem for Larissa), and the impact is curiously compelling. The Schubert "Unfinished" was as arrestingly played as the rest of the programme, and mention must be made of the polished playing from the wind and brass all evening. If the strings had less than ideal weight at times, no one could question their stylish contribution. This concert both played the game and bended the rules in the most interesting possible way - we had what's become a common orchestral concert format of introductory work, concerto and symphony, but most interestingly constituted and creatively "placed", so that the feeling of "the same old formula" was nicely avoided. Taddei conjured from his players some gorgeously-coloured modulations... || In places, Irons, Taddei and the players superbly realized the music's power, those dark coruscations of interchange at the heart of the development dug into with a will, while elsewhere, such as in the orchestral lead-up to the first movement cadenza, there was drama and thrust aplenty, soloist and orchestra each taking it in turns to galvanize the other. ...not to denigrate the achievements of the orchestra with conductor Taddei in the past few years, [but] this was a stunningly successful concert, with playing that in energy, subtlety, freedom of expression and instrumental virtuosity might even have bettered what we often hear from the NZSO. The centerpiece was no doubt the Borodin symphony... both orchestra and conductor totally exuded huge confidence, familiarity (Taddei had no score before him) and where it mattered, a fine sense of heroism, folklorish colour and abandonment. A performance of Debussy’s first large-scale orchestral work opened the concert. The beginning of Nuages, with beautifully modulated winds and, soon, its lovely cor anglais solo, said everything about the maturity and sheer refinement of the orchestra. It was obviously a thoroughly studied achievement; not only were the winds elegant and subtle, but the gleam of the string sections that introduced the second part, Fêtes, might have surprised an audience in Vienna’s Musikverein. The muted trumpets in the middle created a mystical, remote magic; Debussy’s orchestra sounded sometimes is if the Ravel of Daphnis et Chloé, a decade later, had been helping with the orchestration. Guest conductor Marc Taddei brought his distinctive blend of equanimity and inspiring enthusiasm to his direction of Thursday night’s concert. A graduate of the Julliard School, Manhattan, Taddei was visiting from New Zealand where he is now based, and it was interesting to observe the orchestra’s positive response to his baton, particularly in Mendelssohn’s Scottish Symphony, which requires execution of distinctive layered rhythmic patterns by the strings in particular. The concert opened with the Barber Adagio in the performance of great reverence. Again, the soft playing was breathtaking and, if it was slower than I like, the result was entirely convincing. Since Marc Taddei took over the Vector Wellington Orchestra, he has attracted big audiences to concerts, and has done so again with a programme that, on paper at least, looked eccentric. | Not to worry, the concert was, partly thanks to the unusual programming, a fresh, unhackneyed, affair, distinguished ... by excellent playing. ... the best playing of the evening came in the rarely heard ballet Jeu de Cartes (card game). This is a witty work describing a game of cards in three deals, composed in Stravinsky's neo-classical style. Taddei is very good at this type of music – and here he draws some crisp and sure playing. "...Taddei led a vividly colorful reading of 'Pictures [at an Exhibition].' His well-judged pacing and sense of swing in dance rhythms also propelled performances of Prokofiev’s "Lieutenant Kijé" Suite and the "Polovtsian Dances" from Borodin’s "Prince Igor." "All three pieces owe their popularity to tonal brilliance and high-impact brassy, percussive and (in the Borodin) choral climaxes; and the conductor, orchestra and the Richmond Symphony Chorus didn’t skimp on the sonic thrills. But there are rewarding subtleties in the Prokofiev and Ravel’s orchestration, and Taddei made room for most of those finer details, especially contrasts of bright and dusky colors in "Pictures. …and this was a magnificent performance [of Beethoven’s Fifth Piano Concerto]; magisterial in the first movement, deeply poetic in the second and marvellously propulsive in the finale. The orchestra, urgently led by Taddei, was a fine partner, with sweeping strings a feature. The second half was spectacular. Taddei gave us Duke Ellington's ballet suite The River – … originally written for the American Ballet Theatre in 1970. Juilliard trained, Marc Taddei has this music in his bones, and the orchestra gave him verve and great colour. Respighi's orchestral spectacular, Pines of Rome was a technicolour finale. Aided by a bevy of brass band players and the organ, the performance climaxed with a Pines of the Appian Way that was about as loud as anything I have heard in the Town Hall, but my most abiding memory will be some gorgeously rich, hushed, string playing. ...this was the Wellington Orchestra's most polished playing of the year. ... Including Haydn's final symphony ... was a masterstroke... and Taddei drew from his players a performance of real authority and mastery. The drama of the work was played to the hilt, underpinned by stunningly secure trumpets and horns. The string playing was stylish and immensely secure. Beautiful sound and wonderful balances rounded out the year's finest playing from this rapidly developing orchestra. There is no doubt about it, the Wellington Orchestra under Marc Taddei is definitely gathering a following, and the large audience for this concert was further evidence of the fact. ...Right from the ebullience of Bernstein's brief suite from his show On the Town, and finishing with as vital a performance of Brahms' Variations on a Theme of Haydn as one could wish, we were treated to music- making of the highest quality. ...this was [pianist Michael] Houstoun playing Beethoven as never before, and he was solidly backed by Taddei and his appropriately sized orchestra. The audience responded enthusiastically all evening to a concert that was not only superbly performed, but, with its balance between content and guest performers, had its heart in the right place. "There is no denying that Marc Taddei is a communicator, and he certainly has a real feel for programming. "Because he happens to be a highly skilled musician as well, he backs his ideas with performances of real quality, and, under his baton the Vector Wellington Orchestra has developed into an orchestra of considerable polish. So it was no surprise to find a full hall for this enterprising concert, and no-one present would have been disappointed. 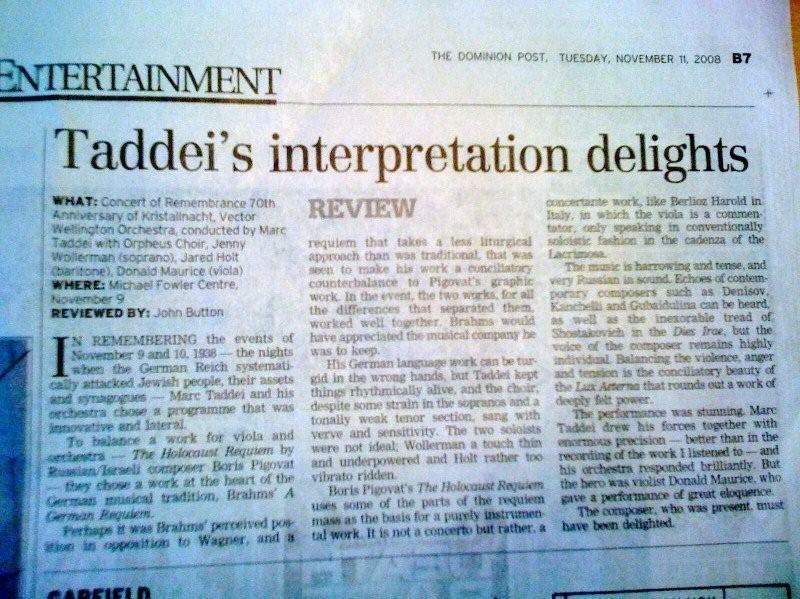 "The concert ended triumphantly ... marshalled with great understanding and skill by Taddei." "Marc Taddei, conductor and music director of the Vector Wellington Orchestra, has again hit the high spots with his programming. His concert of Stravinsky’s Symphony of Psalms and a semi-staged Bartok opera, Bluebeard’s Castle, drew uniform superlatives last year. "I watched Taddei ... selling Ives’ audaciously esoteric Putnam’s Camp from Three Places in New England to an audience of light listeners in Christchurch by telling them how Ives portrayed two different bands street-marching in different directions, metres, tempi and tunes. He had them eating out of his hand. "This immediately empowered Taddei to transmogrify the CSO’s repertoire, suffering initially from bedsores induced by perpetual conservatism, to a large audience lapping up Stravinsky’s Rite of Spring and Taddei’s swan song concert of Strauss’ Four Last Songs with the noisy bravos and stamping of a rock audience. I imagine his communication skill with his audiences is one strong reason that Vector recently extended his contract to 2012. "[Rachmaninoff's Symphony No. 2] gives every element of the orchestra a chance to shine, and Taddei handled it like the professional he is. He knew when to give and when to take. "Taddei held together all the elements with flair and ease. These were not easy pieces, and with him being in town for but a few rehearsals it could have been a difficult concert. "It was, in fact, truly a difficult concert. But not if you were listening or watching. “Orchestras: In programming terms the Vector Wellington Orchestra outstripped the NZSO [National Orchestra] … The orchestral highlight was undoubtedly the VWO presentation of Bartok’s one-act opera Bluebeard’s Castle with Margaret Medlyn and Paul Whelan, conducted by Marc Taddei. The orchestra rose magnificently to the occasion. "The performance was stunning. Marc Taddei drew forces together with enormous precision – better than in the recording of the work I listened to – and his orchestra responded brilliantly... The composer, who was present must have been delighted." "The Vector Wellington Orchestra just keep getting better and better, and Saturday’s concert reached the pinnacle of their year’s work...they outdid themselves... It was an absolute triumph! "Bartok’s Bluebeard’s Castle showed the orchestra off to it’s very best, playing well above their weight... and nothing demonstrated this more than the moment of the opening of the 5th door when the Town Hall organ added it’s weight to the sound, the effect was overwhemingly, viscerally exciting. It was magnificent, creating an unforgettable impression. "But...the evening belonged to conductor Marc Taddei who steered the orchestra, chorus and soloists through with quiet, (not a term used often about Taddei) authority. His intensity, commitment and attention to detail gave the performance true gravitas. He is very quick to give generous accolades to his performers but on this occasion he deserved every bit of the audience’s enthusiastic response." “This was the most exciting concert in prospect; highlight of the Vector Wellington Orchestra's 2008 programme. "[Stravinsky's Symphony of Psalms and Bartok's Bluebeard's Castle were] not going to attract quite the full houses of other concerts, but the generous attendance must have been gratifying, and the performances produced huge enthusiasm. “With good reason, for this was an evening of fantastic music and an astonishing level of achievement. “This was a sensational performance… And the orchestra was magnificent. "Under Taddei’s dynamic direction the orchestra responded with great strength and precision making for a marvellously affecting and powerful performance from everybody.
" Probably The Vector Wellington Orchestra’s best concert to date under Taddei and a concert year highlight." "For Marc Taddei's final appearance as musical director, two particularly complex and challenging works were presented. I was then going to say that both lay well outside this orchestra's musical tradition, but on reflection it seems that maestro Taddei has so extended the range of music the orchestra plays that its tradition now encompasses almost everything. "...This was a deeply impressive performance [of Richard Strauss' Four Last Songs], particularly from the orchestra, where you really had the sensation that the conductor was working his players before your very eyes to produce the subtleties of texture, balance and colour that you were hearing. "...Balance between singer and band, so easy to achieve in the recording studio, so difficult on stage, was exceptionally good. "...This concert was a very fine achievement in its own right, something of a milestone in the orchestra's history, and a great way to remember Marc Taddei's magnificent contribution as musical director." "The Christchurch Symphony music director delivers a breathtaking farewell concert. "It took Marc Taddei only one year as music director and chief conductor of the Christchurch Symphony to turn repertoire and public taste on its head. Orpheus and Bacchus blew him here. The new works he introduced in his first two years alone surpassed the total in the orchestra's history. All his substantial legacy to Christchurch has radiated out from this innovative ebullience; the perfect tonic when previous programmers had given the orchestra bedsores by locking the players into stale stuff for years. His typical American ability to break down formal barriers through friendly chat enabled him to take his audience with him, no matter how demanding the programme. "His local premiere of Stravinsky's Rite of Spring drew a rock-concert response from a large crowd.... His most esoteric performance, last year's The Timeless Land, was 150 minutes of unadulterated New Zealand modernism - a first for the country in intermedia works. It pulled in 1500 people. "...Take a bow, Taddei and players. You gave us a night to treasure." "The audience received full value for money, with a well-balanced programme, excellent playing and highly focused, almost charismatic conducting. "The orchestra played with enormous confidence, promising much for the future under its new music director." "Marc Taddei, an American conductor working mostly in New Zealand, appeared as guest with the New Haven Symphony Orchestra Thursday in an impressive concert. To judge from his leadership of this all-German program in Woolsey Hall, Taddei is a musician of strong technical accomplishments and equally strong ideas. "The hour-long Symphony No. 4 by Gustav Mahler found the conductor in his element... He probed and plumbed the score - you might even say he ransacked it - for every possibly nugget of interpretive splendor. "The result was a stunning virtuoso demonstration of musical variety, with the excellent instrumentalists responding wholeheartedly to the conductor with as much diversity with one instrument apiece..."
"Taddei's conducting articulated the work's inventiveness with energy. Ditto Stravinsky's Firebird, especially the excitement he generated in 'King Kastchei's Dance'..."
"...Marc Taddei took things to another level. This performance of Brahms' First Symphony was simply hair-raising. Right from the first imperious bars there was a tension and authority that completely belied the status of this young orchestra. Every section played as if their lives were at stake, and with a polish that was simply amazing. All the brass, with the brilliant horns to the fore, crowned a performance in which Taddei's fiery interpretation took no prisoners. Astonishing." "...Obviously, Taddei got it right. In 2003, there was a 35 percent increase in concert attendances. In 2004, this went up another 17 percent and earned the orchestra a handsome profit of $90,000. In 2005, there has been another 12 percent increase. 'I'm thrilled about this. It goes against an international trend in which orchestras have seen a big loss of audience share. But not in Christchurch!'" "His innovations this year alone surpass those of the Christchurch Symphony's entire history before he arrived as its music director four years ago. The orchestra's previous CEO had provocatively rubbished New Zealand music as "the kiss of death". How ironic, then, that 1500 people turned up to hear the quintet of new Kiwi works ..."
"The two strongest points...under Marc Taddei were frenetic passion and the players' tight cohesion... Taddei's innovative programming makes him by far the gutsiest music director the CS has had." "In the whole work, the conductor Marc Taddei demonstrated his understanding of every tiny element of the work. Under his leadership the orchestra succeeded in delivering an astonishing performance...[Taddei] had a deep insight into Mozart. Moreover, his ideas were well thought out in detail." 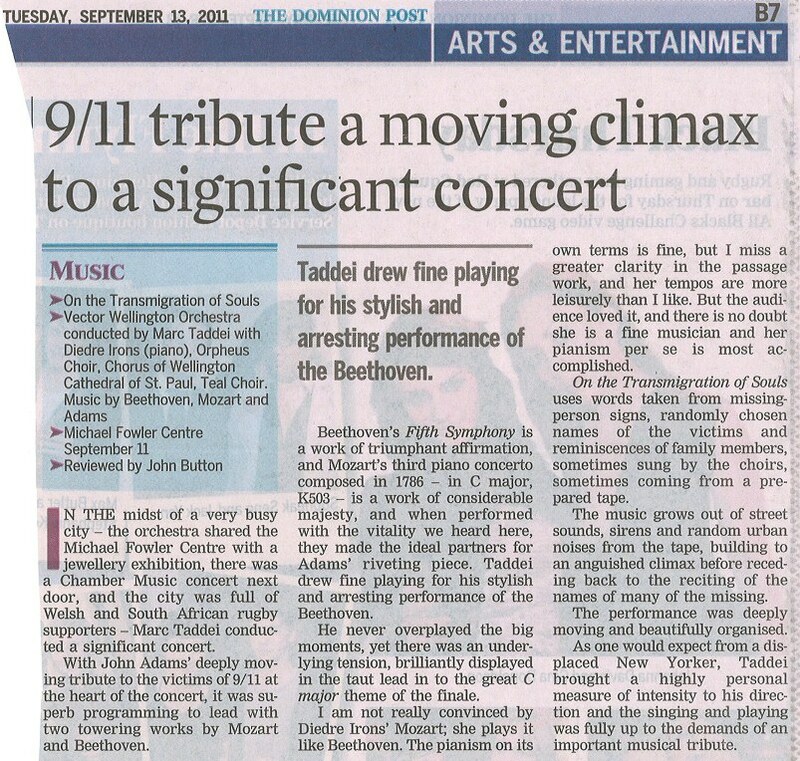 "(Bouquet for Marc Taddei) the orchestra's music director, whose energy, exuberance, drive and vision proved beyond all doubt that music is an essential feature of daily life in a 21st century city." "Taddei's interpretations of Mozart's Overture to the Impressario and Brahms' Piano Concerto No. 1 were precise but fresh, and he has a charming sense of humor." "Marc Taddei skillfully took the Christchurch Symphony Orchestra to new heights with an outstanding concert that was nothing short of brilliant in all aspects. ...Taddei had the audience on the edge of their seats." "People accurately comment how the CS playing standards have shot up recently. With this concert its upward curve still climbs impressively." "Conductor Marc Taddei delivered an evening of exhilarating music in this Masterworks concert with its exciting works, their dynamic interpretation and superlative performances under his baton." "DON QUIXOTE A MILESTONE FOR CS (review title) - It was a feather in the cap for Marc Taddei and his troops." "The infectious vivacity which Marc Taddei brings to the conducting platform is mirrored by the spice he has added to the orchestra's repertoire." 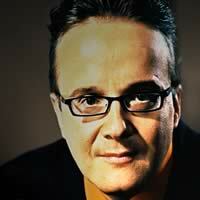 "We could clearly hear Marc Taddei's very dramatic way with this symphony. From the dramatic opening horns to the headlong tempo of the finale, this was real Tchaikovsky - unleashed and uncompromised." "Sample the most frenetic track, Ginastera's Malambo, and you'll be hooked. Conductor Marc Taddei's freshness and immediacy in his interpretations are invigorating and stem from the dramatic intensity in his approach and quitting of climaxes , his lively nuancing of phrases and keenly struck tempi." "It was delicately done, with many nice expressive touches, completing yet another cleverly programmed and well-managed Christchurch Symphony concert." "Marc Taddei prepared the score fastidiously separating its complex and continually changing foreground from background material and shaping the whole with a finely judged dramatic momentum." "Overall this is one of the best Harolds you'll find anywhere, and the Bartok will appeal to anyone dissatisfied by previous editions of the score." conductor Marc Taddei urged his players to a new level of sophistication and polish"
"Marc Taddei coloured things exquisitely, shaping and highlighting phrases and allowing each glorious moment to sparkle." "Under the skillful guide of Marc Taddei the NZ Symphony glides and crashes on to victory with precision and energy. Marvelous." "Taddei (proved to be) a thoroughly idiomatic conductor, with a feel for texture and luxurious string sonorities a feature." "What is it about this group of musicians, with their conductor Marc Taddei, that constantly awe me with their inspirational playing?" "Marc Taddei is revealing himself to be a thinking interpreter of all the works he conducts, as well as showing a rare ability to train an orchestra." "Here in our midst we have a conductor who is young, charismatic, and is able to communicate his emotions and visions of these great works to an orchestra, so that they can reach out and touch an audience like very few can actually do." an easy communicator with players and audience alike with a rare clarity of beat as well as intention, occasionally airborne with enthusiasm." with Taddei revealing real interpretive gifts as a conductor, this was a concert to warm the heart." "his sense of commitment to the music was palpable."